We’ve had several companies contact us asking “how do we get more people to visit our booth”. In our eyes, conferences are about building relationships and making meaningful / memorable interactions. There is no one email, giveaway item, or mixer that is going to build relationships and interactions, but a collaboration of these efforts will. We like to use automated marketing to help our clients make the most out of the conferences they attend. Automated marketing is made up of if-this-then-that scenarios that are based on the actions that your prospects take on your website and emails that you send. • Create a blog post on your website about what you will be showcasing at your booth, what reps will be there, any giveaways, etc. • Send an email to all attendees about the blog encouraging them to click through to your website to read the full blog. • When they visit the site, your automated marketing will track them and prompt another email to be sent inviting them to join you for a mixer / breakfast. This email will link to a landing page that will collect all of their details when they rsvp. 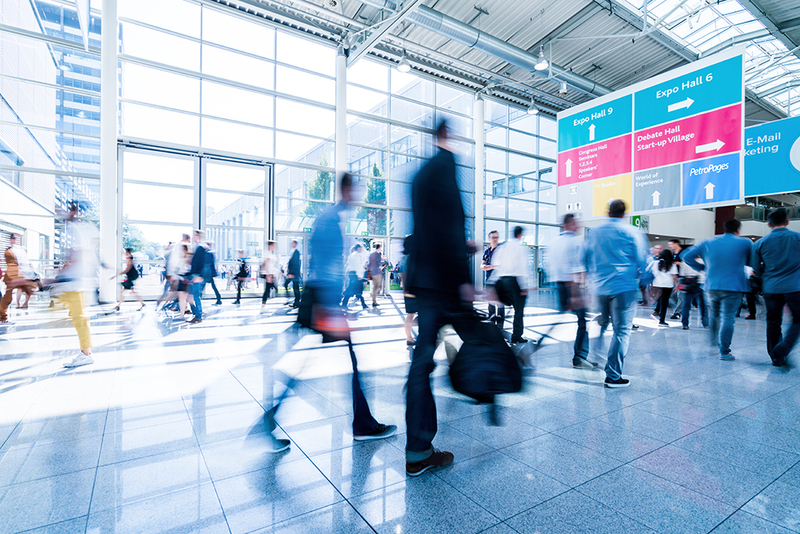 • An automatic reminder email will be sent out the week of the conference inviting them to visit your booth and that you are excited to see them at the mixer. • After the conference, a thank you email will be sent out with links back to your website’s blog post with pictures from the conference and mixer. Now for something interesting at your booth to attract visitors and create memorable interactions. 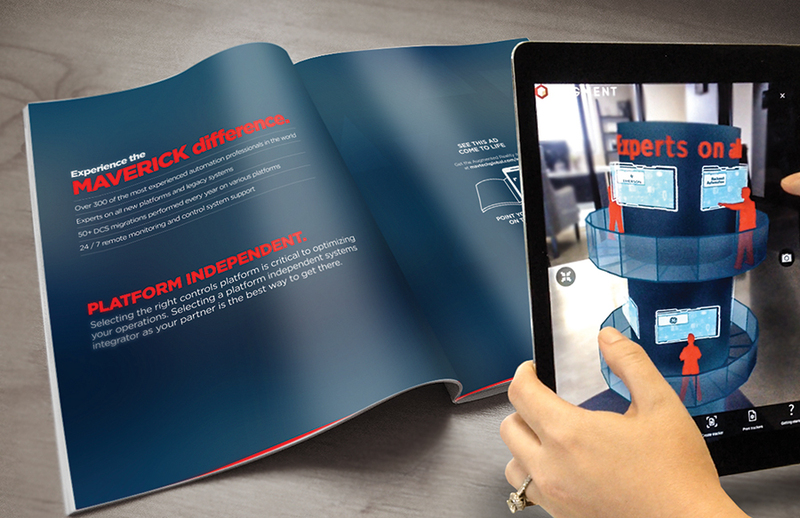 Augmented reality is a new technology that is emerging in conferences that allows a 3D model to project from any print material (product line sheet, brochure, invite, etc.). • We create a 3D model of your product with a ¼ cutaway. • This 3D model would be anchored to the product image on a one-page line sheet. • Once the user scans the image of the product with a tablet or phone the 3D model will superimpose on the line sheet allowing the prospect to look all around and zoom in to see the details of the model. AR allows you to stand out as being at the forefront of technology is a great draw to booths especially if you have lines sheets on a podium out front with reps showing how it works to passersbys. I have shown this technology at several shows and everyone has been very impressed and excited to show their team. Since they have the brochure they can take it and use their phone to show it off creating some good word of mouth. Contact one of our knowledgeable and friendly marketing strategist today to learn how PetroPages can help you make the most out of your conferences! We checked Automated Marketing for you, now feel free to inquire about our other services. Laura Pace graduated with a B.B.A. in Marketing from Texas State University. In the top 15%, she didn’t just go there to party! During her time at Texas State she helped lead the American Marketing Association and American Advertising Federation groups to national competitions. It is through these organizations, great teachers and an internship with a local magazine that she developed a passion for marketing and helping businesses grow. Since graduation, Laura has gained over five years of marketing experience in the oil & gas industry and is now a Marketing Strategist at PetroPages, Inc. “It is always amazing to me to see how strong branding and well-executed marketing communications can dramatically change how a business is perceived, this is one aspect of our services that drives me each and every day”. In her free time, Laura enjoys Texas-country concerts, visiting breweries/wineries, and talking walks and splash pad hopping with her husband, Michael, adorable daughter, Emma and baby Mitchell.